It's great to have access to the Internet on your phone, but sometimes you'd really like to share that connection with a laptop or tablet. You can! It's called tethering; turning your phone into a personal Wi-Fi hotspot. But which phones can tether, how do you do it, what will it cost — and is it worth it? 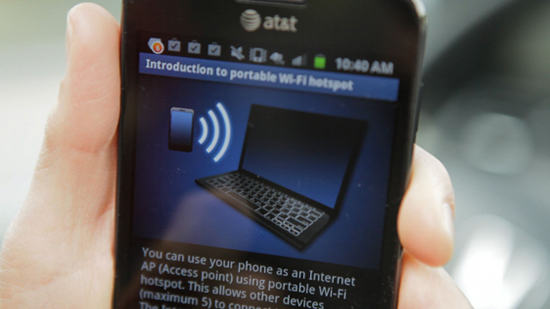 Tethering, or setting up a personal Wi-Fi hotspot, takes the Internet connectivity in your phone and broadcasts it for a laptop, tablet, or other devices that access the Internet. Which phones can act as hotspots? All major cell carriers offer tethering, and hundreds of smartphones have the functionality, including the iPhone 4, 4S, 3G and 3GS, many Blackberries, almost all Windows phones, and lots of Android phones. This list is from November 2011, but it's a good starting point to see if your phone is hotspot capable. All the carriers offer tethering and all of them charge you for it. While you are technically sharing the data you are already paying for, it costs a substantial chunk of change to enable the feature. T-Mobile charges an extra $15 a month, Verizon and AT&T charge an extra $20 a month, and Sprint charges an extra $30 a month. There are apps that create hotspots without this extra fee, but the carriers don't like it and are starting to crack down. They scan for these apps and may surprise you in your next bill by adding the tethering fee automatically. It's easy to do. Just go to the "Settings" menu on you phone, and enable personal hotspot. In the iPhone, it's under General, Network, then touch Personal Hotspot. It's just as easy with Android phones. In Settings, look for Tethering, Personal Hotspot, or even Mobile AP (AP stands for "access point"). You may have to contact your carrier to enable the feature, but some will let you initiate the service directly from the settings menu. How do I connect to my devices? Multiple devices can be connected, and you can do this via Wi-Fi, Bluetooth, or hardwire your phone to the device of your choice with a USB cable. If you choose Wi-Fi, your laptop will see the phone in the same way it sees any other routers or Wi-Fi network. However you normally add a new network, do the same when accessing your phone's Internet connection. Same for tablets or gaming devices. If there's any confusion, go back to the settings in your phone where you set the hotspot up and you should see an SSID or Network name field that has a unique identifier. For my Android phone, it produced a not-so-user-friendly network SSID of GSIIskyrocket_9482. Look for something equally undecipherable from your phone. Security: If your phone lets you, click the security options, and add a password to your new hotspot. You don't want to broadcast an open Wi-Fi signal for just anyone to use. Battery: Broadcasting that Wi-Fi signal eats your phone's battery like crazy, so plug in or have a backup battery. If you're on the road a lot, it's worth investing in an inverter that allows you to charge your phone or laptop off your car's cigarette lighter. We set this video up as a use-case: you're on the road and the boss needs a document from your laptop. We are NOT advocating using your laptop while you drive or distracted driving in any form.